Summer is coming. Do you know how I know that? Because my local grocery store is starting to have more fresh, local produce. I get so excited when I see local produce for two reasons: the first reason is that it’s more abundant, therefore it’s cheaper; and the second reason is that I can buy more of it which allows me to spend more quality time with my kitchen! It’s this time of year that local supermarkets and farmer’s markets will have an abundance of red peppers, and if you’re lucky, you can get a large, sweet red pepper for about $0.50 each. To make a large 1 litre jar of roasted red peppers like the one pictured below, you’ll need a dozen peppers. Now, unless you’re a hot-blooded Italian, like my friend Nadia, you’re probably asking why you might need a 1 litre jar of roasted red peppers. So let me take a moment to explain the benefits of having prepared roasted peppers on hand, and list the many options you’ll have for cooking and preparing meals with tastier results. The process is simple. Thoroughly wash the red peppers and carefully dry them. You want to dry all of the water so that you can rub them lightly with olive oil. Being sure to fully dry the peppers first will help the oil coat the peppers better. Next, slice the peppers in half, lengthwise, and remove the seeds and stem. Lightly coat the peppers in olive oil and place the peppers cut side down on a large sheet tray and place directly under a broiler set at 500 degrees. (You can certainly use your outdoor grill if you have one. Just placed the peppers on the grill and turn regularly.) In either case, you’ll be looking for blackened, blistering skin. Once you have achieved this, remove the peppers from the oven and place in a large glass bowl. Using plastic wrap, form a tight seal over the bowl, trapping the steam from the hot peppers inside. The steam will help the skin separate itself from the flesh of the peppers. After the peppers are cool enough to touch, massage the peppers gently, removing the skin. Slice the peppers in any fashion you desire. I prefer to quarter them so that I have more presentation options when I’m using them in my cooking at a later time. 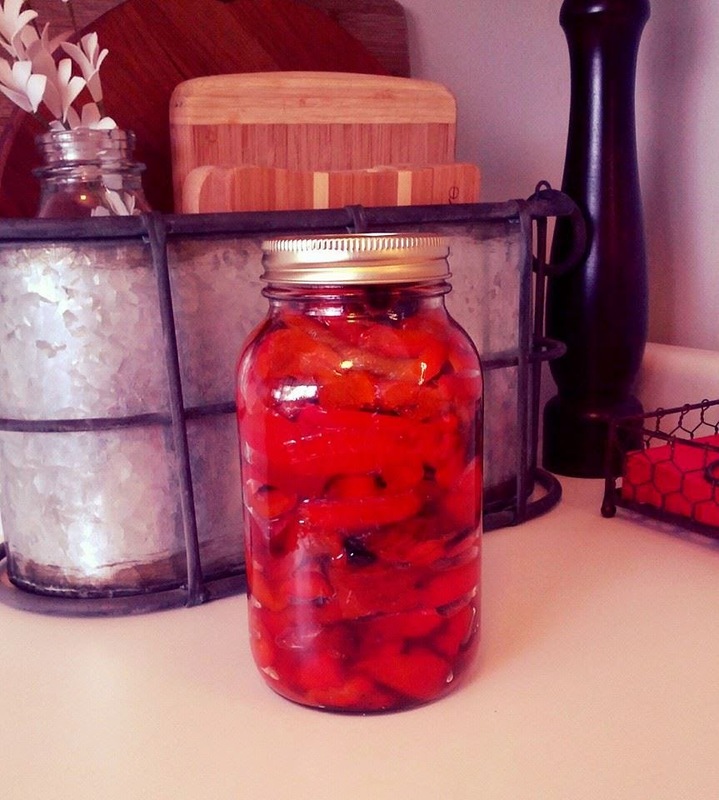 Pack the peppers into a very clean large mason jar. Once the jar is full, fill the jar with boiling water. Add the seal and the lid, and once completely cooled, place in the refrigerator. These peppers will last for a few weeks in the refrigerator, however, if you are unable to use them all up in time, consider freezing them, or making a large batch of roasted red pepper pesto and toss with pasta. Yum! These look so great. My mother-in-law's peppers are so amazing that I suppose I've just never tried because I felt like mine would never compare! These ingredients look awesome. Will give this one a go. Oh, yum! I'm going to have to try these. I usually buy the roasted red peppers, but it's always better to do things homemade. Thanks for sharing. So that's how they do it. Good to know! We love peppers, but I've never canned before. Thank you!